This season of Lent is marked by a special emphasis on spiritual disciplines; things like fasting, prayer, and reading Scripture. I, personally, find these activities important because they provide me space to be with God. When I fast or pray or read Scripture, I get a chance to sit myself in front of God and listen. Which makes me think that these are things Mary would do. Not me Mary, but Mary-and-Martha Mary. Jesus comes to visit this pair of sisters, and they respond to his arrival in two very different ways. Martha does what needs to be done when an unexpected visitor comes to your home: she runs around cleaning the bathrooms and setting the table and cooking a meal. Mary does not; while her sister is in a frenzy, Mary simply sits at Jesus’ feet and listens to him. Jesus praises Mary for her choice: “one thing is needful. Mary has chosen the good portion, which shall not be taken away from her” (Luke 10:42). So the moral of the story is: don’t serve like Martha; instead, sit and listen to Jesus like Mary. “The kings of the Gentiles lord it over them; and those in authority over them are called benefactors. But not so with you; rather the greatest among you must become like the youngest, and the leader like one who serves. For who is greater, the one who is at the table or the one who serves? Is it not the one at the table? But I am among you as one who serves” (22:25-27). Isn’t Martha serving? Doesn’t Jesus like serving? Why does Jesus say Mary has chosen the “good portion”? Mary and Martha are sisters. Richard Foster points this out in his reflections on Eckhart’s sermon. These women are sisters. 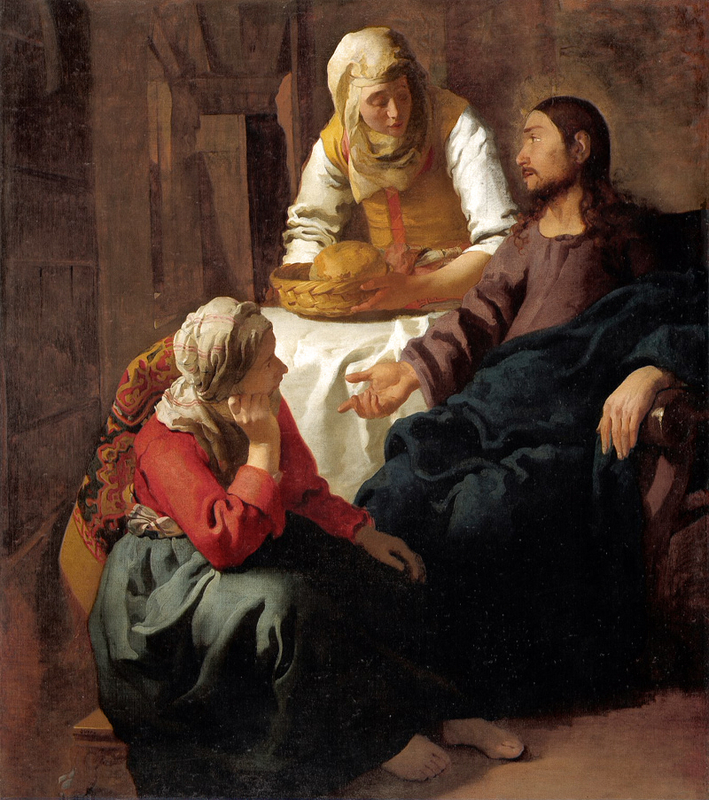 Mary sitting at Jesus’ feet and Martha walking around serving – they are a pair. In the same way, the “sisters” of our spiritual life are acts that sit us before God and acts put us in service to others. We need to pray, and read our Bible, and fast. But we also need to serve. It’s a package deal. Both Works of Piety and Works of Mercy are needed. They’re sisters. During this season of Lent, I hope very much that you’ve been sitting at Jesus’ feet. Maybe you’ve given something up and that sacrifice draws you close to God. Or maybe you’re spending extra time in prayer and Scripture. Good! Yes! Do that! But don’t forget that those Works of Piety have a sister. During this fifth week of Lent, make a special effort to serve others. As you go throughout your day, think – “Where would Martha see a chance to serve?” Don’t let a day go by without doing some act of service. If you have roommates, try to do an extra chore to make their lives easier. Look around at your neighbors and see who is lonely or who needs their lawn mowed. Write a letter to someone in prison (I can make a recommendation if you need one!). Spend time each day like Mary – sitting and listening to God. But don’t forget her sister. Put yourself in Martha’s shoes, and see what effect acts of service have on your faith.